So many options!! - It's best to call or email us (MicroWay) with your Microsoft Office licensing requirements so we can provide you with specific, relevant options – and save you time and money! 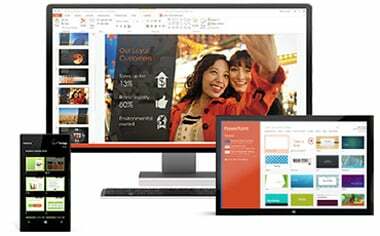 Office, Visio and Project – All Microsoft Office and Office 365 products are available with volume discounts, and many have both Annual and Perpetual (permanent) licensing options. IMPORTANT: If you want to order Visio or Project for a system you already have Office or Office 365 installed on, you need to be sure you select the correct license type - or it will not be possible to install them on the same system. MicroWay can assist you with ordering the correct type for your situation. Whether you're working in your office or on the go, you get a familiar, top-of-the-line set of productivity tools. Office applications — always the latest versions — that let you create, edit, and share from your PC/Mac, iPad, tablet, or phone with anyone in real time. Work wherever you are, whenever you need to, on whatever device you choose. Share files. Join meetings. Stay in sync with your team. When there's work to be done, your Office is right there. Install Office on up to five of your PCs, Macs, or iPad or Windows tablets, and transfer the installation to new devices whenever you need to — fast. Office 365 stays up to date, so you'll always be working with the latest version of your favorite applications, such as Word, Excel, PowerPoint, and Outlook. Because your files are automatically saved online, you can access, edit and share the latest version, even when you're on the go. For further information on Windows Server please call MicroWay on 1300 553 313 or email.